The British & Irish Lions stumbled to victory in their opening tour match against a scratch side of second division players, known as the Royal XV. The 37-25 win flattered the tourists as they were made to work hard at the Royal Bafokeng Sports Palace. Ronan O’Gara notched up 22 points as the Lions fought back after being 18-3 down to the side that is made up of Vodacom Cup players comprising five different teams. Eigthman Jonathan Mokoena and scrumhalf Sarel Pretorious in particular showed their quality for the home side. After an awful start to the match that lacked precision and composure, with Munsterman Keith Earls in particular having a shocker, the Lions battled back and showed their experience to regain the lead with four minutes remaining. O’Gara added to his seven from seven kicks as he scored a try on the final whistle, taking the winning margin to a flattering 12 points. It was a wake up call of note as the Lions showed nerves and rustiness, lacking execution and making numerous errors against a side that on paper, is by far the weakest that they’ll face on tour. Lee Byrne was the most impressive Lion on the day, with Jamie Roberts looking imposing and captain Paul O’Connell leading from the front, mainly in the second half. Former England captain Phil Vickery sees this as a wake up call. The British & Irish Lions next match is against the Golden Lions in Johannesburg on Wednesday. They'll be up against a stronger side than the Royal XV, so the Lions will look to find cohesion and iron out the nerves that we saw on Saturday. The Bulls won their second Super 14 title in three seasons when they overwhelmed the visiting Chiefs at Loftus Versfeld yesterday. The 61-17 win is a Super 14 final record for the highest winning margin. In front of an extremely passionate Loftus capacity crowd of 52 000, the Bulls conceded early, silencing the faithful momentarily. That didn’t last long though as they soon got on the board through scrumhalf Fourie Du Preez, who picked up two quick fire tries. Bryan Habana soon got in on the act after collecting a neat Du Preez kick ahead, then later on sniffing out a trademark intercept try. After forty minutes the match was all but over at 34-7, with seemingly no way for the visitors to stop the blue tide. They got back into the match after halftime, taking the score up to a more respectable 37-17, but the Bulls controlled matters by scoring through Victor Matfield, Wynand Olivier, and a breakaway sprint once again from Pierre Spies. Shortly before the end of the match, Danie Rossouw crossed to rub salt into the wound, making this easily the highest winning total in Super rugby finals history. Scoring eight tries in total, the Bulls showed what a powerful side they are at home as they justified their top of the table standing by totally outplaying the Chiefs. Both sides played positively from the start, showing us that finals of big competitions don't have to be dominated by the boot. 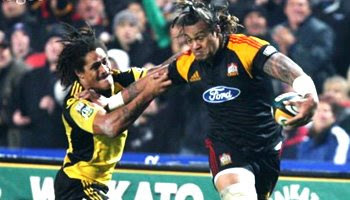 “They showed us how to play,” Chiefs captain Mils Muliaina said. It's been twelve long years since the British & Irish Lions last toured South Africa. The 1997 Lions series is considered by many to be one of the best, and tomorrow we'll watch closely as the new breed of players look to emulate past success as they kick off the 2009 tour with a match against the Royal XV in Rustenburg. The Lions have picked a fairly strong side, minus players who were involved in big matches recently. The match with the Royal XV should be the easiest of the tour as they'll be up against a bunch of unknown players who won't have too much cohesion. The side was announced yesterday and they're raring to go. "After all the preparation the match against the Royal XV on Saturday marks the start of the 2009 tour. Everyone in the tour party is looking forward to getting the playing part of the tour underway," manager Gerald Davies said. Coach Ian McGeechan is looking forward to the occasion, and seeing some youngsters making a name for themselves. "I think it is really exciting that we have a lot of players making their debuts. I remember my debut against Western Transvaal at Potchefstroom in 1974 and it is a career highlight. "For young men such as Keith Earls and Jamie Roberts it will be a day to remember and they will be thrilled to get an early taste of match action on the tour. Outside these guys is the proven experienced combination of the Ospreys' back three of Byrne, Bowe and Shane Williams." This advert, which features the HSBC Lions ambassadors Gavin Hastings, Gareth Edwards, Jason Robinson, and Brian O'Driscoll, is just a bit of fun ahead of the tour. Russell Jeacocks, Egon Seconds, Deon van Rensburg, Hanno Coetzee, Bjorn Basson, Naas Olivier, Sarel Pretorius, Jonathan Mokuena, Devon Raubenheimer, Wilhelm Koch, Jacques Lombaard, Rudi Mathee, Bees Roux, Rayno Barnes, Albertus Buckle. Replacements: Pellow van der Westhuizen, Stef Roberts, Rynard Landman, RW Kember, Jacques Coetzee, Riaan Viljoen, Jovan Bowles. Irish referee George Clancy had his hands full last weekend as he had the honour of refereeing the tempestuous European Challenge Cup final between the Northampton Saints and Bourgoin. As featured throughout the week here on RD, the match was incident packed with Clancy having to dish out two yellow cards and a red as scuffles broke out at regular intervals. He took a bit of criticism for the way he handled the fiery contest, and you could see that players on both sides were frustrated at some of the decisions at times. Clancy got in flanker Neil Best’s way at one stage, to which Best didn’t take too kindly as he gave Clancy a shove out the way. Note how he tossed the ball in his direction too, after the pass to him was called forward. Was it aimed at the player who dumped him to the ground, or at the ref himself? Either way, it was funny to see how he wasn’t too concerned about barging him out of his path. A few minutes later, Clancy had no hesitation in yellow carding him for his part in a scuffle. England won the home leg of the IRB World Sevens Series at Twickenham in London on Sunday with a thrilling 31-26 victory over New Zealand in a classic final that went to sudden death extra time. In front of a festive home crowd, the England side staged a miraculous comeback with three quick fire tries after being 19-0 down at half time. Tries from Uche Oduoza, Micky Young, and James Rodwell pulled things back after New Zealand had flown ahead early on, thanks to a Kurt Baker try, and two from Julien Savea. At 19-19 and with little time left in the match, the ever impressive Zar Lawrence crossed for the try that looked like breaking English hearts. An inspired substitution by English coach Ben Ryan meant that the flying youngster Dan Norton came on and with his first touch of the ball, gassed the New Zealand defence to score a classic try and keep the home side in the match. Three minutes into extra time, Mickey Young darted over for the winning try, capping a sensational final that will live long in the memory of those who turned out at Twickenham to support this fantastic shortened version of the game. "We never gave up believing in ourselves even though we were 19-0 down at half time," said England coach Ben Ryan. "We knew we had a mountain to climb, New Zealand had their tails up and we hadn't been making progress. "In the second half we allowed ourselves to breathe a bit more in attack and tightened up our defence. Then we brought on Dan Norton and that was that." Would you like to see Rugby Sevens in the Olympics? 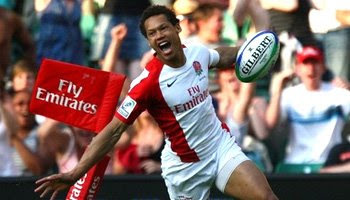 Show your support by signing the petition at Olympic-Rugby.org now! The European Challenge Cup final will be remembered as being one of the most fiercely confrontational matches of the season. The 15-3 win for Northampton Saints over Bourgoin was try-less, but was packed with action from start to finish. Early on in the match it looked as though Irish referee George Clancy was struggling to control matters as the fiery French side got frustrated with his decisions. Saints had expected the match to be physical, and they got exactly that as niggle crept in. Morgan Parra and Neil Best got themselves in a tussle shortly before halftime, resulting in Best receiving a messy looking black eye, and both players being shown yellow cards. Later in the match, about 2 mins after Saints replacement lock Courney Lawes put in a huge hit that injured scrumhalf Parra, Bourgoin’s Thomas Genevois decided it was payback time and unleashed a punch on Lawes, which started another brawl. Captain Julien Frier then landed a punch on Scottish prop Euan Murray, splitting Murray’s eye and earning himself a meeting with the disciplinary committee, as he's since been cited by the match citing commissioner. Murray did well to refrain from retaliating, which would have surely jeopardised his British & Irish Lions tour, à la Alan Quinlan. Genevois was red carded, although he was determined to stop the ref from showing it, leaning towards the side of misconduct of a different manner. Following the next lineout, another incident sparked a small scuffle again, as Lawes put in a seemingly late and unnecessary challenge over the dead ball line. He was penalised, but some thought it should have perhaps warranted further action. It was a chaotic but enjoyable final that had moments that probably weren't a great advert for the game of rugby. In terms of intensity though, it lacked nothing, which made for quite a spectacle. As Leinster continue to paint Ireland a shade of blue following their Heineken Cup victory over Leicester on Saturday, we look back at one of the moments of the match as two big wingers went up against each other in a heavyweight contest that was emphatically one sided. Shane Horgan was picked to start for Leinster with coach Michael Cheika knowing all too well that he'd be up against the power of the Samoan bulldozer Alesana Tuilagi. Early in the match we saw Rocky Elsom storm over the top of Tuilagi, and not too long afterwards Horgan gave him a little shove over the touchline, which the powerhouse Tiger winger clearly didn't take too kindly to. Horgan is a big unit himself, standing at 6ft4, he's one of the biggest international wings around. That didn't faze Tuilagi though, as later in the game he zeroed in on the Irishman, leaving him on his backside, wondering what day it was after this rampaging run. Tuilagi is famous for those type of charges, but was also recently suspended for a bit of dirty play, returning for the final. He showed great sportsmanship and humility after this devastating run though, as he went to check if Horgan was okay. Or, did he..? Great rugby all round, and just another high point in a fantastic final for the neutral. The British & Irish Lions are in South Africa as they embark on the challenge of playing ten matches around the country in a short period of time. The last time the Lions toured there ended in success, which local fans are still sore about. In 1997 the Sprinboks were World Champions, as they are now, and they fully expected to win the series with no problems whatsoever. Jeremy Guscott saw things differently though, as his winning drop goal in the second test clinched the series for the visitors. This time around, the Lions have once again had very little time to prepare and have an immensely physical and determined opposition in front of them. Three Test matches and bruising warm up games lie in wait as this team of stars must click together asap. From a South African point of view, Lions fever has hit the country and there is a buzz and excitement around the series, as revenge for 12 years ago is on everyone’s minds. Besides being die hard supporters, as rugby fans, the country can’t wait for an intriguing series that should be eventful whenever the Lions take to the field. Pirates rugby club in Johannesburg, only a stones throw away from where RD was created (and where I’ve spent many hours playing), will be one of the many drinking holes in the city where fans will get behind their team and enjoy the series. As the excitement around the rugby world grows for this fascinating series, we’ll try bring you random clips that give you a feel for the atmosphere and vibe that surrounds the tour. The British & Irish Lions play their first match this Saturday, against the Royal XV side. Check our fixtures page for further details of upcoming matches. Wallaby Rocky Elsom is expected to make a decision about his near future within the next week, as he contemplates returning to an international career with Australia. Elsom had a cracking game for Leinster on the weekend, earning him man of the match and much deserved praise from all corners. 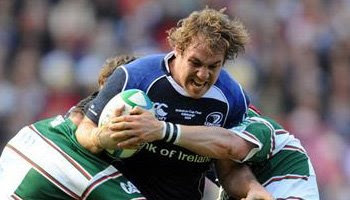 The rugged flanker has had a superb season with Leinster, but has made his desire to play for Australia once again clear. To do that, he will need to return home and play for a franchise there. The Brumbies, Queensland, and NSW have all shown interest, but the ARU are apparently not keen on bending the rules for Elsom, as the NZRU did for Dan Carter. Brian O’Driscoll couldn’t say enough about Elsom’s contribution this season. 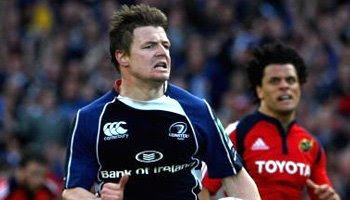 "I would say the best player I have ever played with and I have played with many good players," O'Driscoll said. "Lets put it this way, we wouldn't have won the Heineken Cup without Rocky Elsom. He doesn't make many errors and his ball carrying is frightening. "Irrespective of what happened today Rocky Elsom is the player of the Heineken Cup and you saw the display he produced today, he is just a remarkable player." Elsom was all over the park on Saturday, sidestepping and handing off opponents with ease. 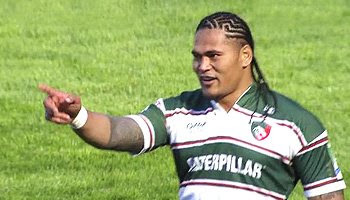 His charge over the top of the powerful Alesana Tuilagi, giving the big Samoan some of his own medicine, was awesome. Any side in the world would be blessed to have Elsom in their ranks. His destination remains to be seen, but you can be sure that he’ll give 110% wherever ends up. The Bulls will meet the Chiefs in the final of the Super 14 at next weekend after they staged a stunning recovery to beat the Crusaders 36-23 at Loftus Versfeld this past weekend. An early try by Bryan Habana got the home team on the board, but it was last years champions, the Crusaders, who then flew off to a 20-7 lead, much to the dismay of the 52 000 strong home crowd. The Bulls the staged an inspired comeback as they scored 22 points in eight minutes, taking them to a 27-20 half-time lead. Flyhalf Morne Steyn did his Springbok aspirations no harm as he kicked four drop goals and converted three of the Bulls tries, contributing 21 points and earning him the Man of the Match award. The Bulls will host the Final at Loftus Versfeld on Saturday against the Chiefs. Home advantage will be a huge factor, with the majority of tickets already sold out. "We will need to build extra stands for the final," joked Bulls skipper Victor Matfield as he thanked the passionate blue-clad crowd after the match. "The Crusaders began with a bang and the way our boys came back was nothing less than awesome." Crusaders captain Richie McCaw accepted defeat with dignity. "We were not good enough because after a great start we surrendered the momentum to the Bulls." 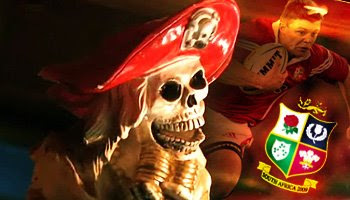 Kick off is at 17:30 local time (GMT +2) on Saturday 30th May. Northampton Saints finished off a successful season back in top flight rugby as they beat Bourgoin 15-3 in the European Challenge Cup final on Friday. Saints have now qualified for next seasons Heineken Cup, knocking out Wasps in the process. No tries were scored in the ill-tempered match which had two yellows and a red handed out. Steven Myler kicked 5 penalties for the home side, keeping them in control of the game throughout. French scrumhalf Morgan Parra was unfortunately injured in this crunching tackle from young Northampton lock Courtney Lawes. The Bourgoin players were clearly incensed at Lawes' being viewed as not being worthy of even a talking to from the referee. 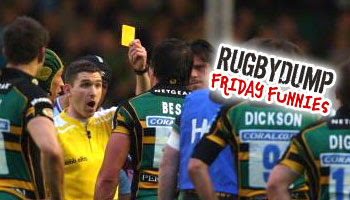 Two minutes later they took it out on Lawes, which led to the red card for punching. Bourgoin coach Eric Catinot later suggested that the referee was a bit lost, and complained that Lawes had been just as deserving of a red card. Dimitri Yachvili has since been called up to the French squad to replace the injured Parra, who was set to tour New Zealand and Australia in June. Yachvili will compete for a starting place with Leicester number nine and former Biarritz team-mate Julien Dupuy. This isnt the first time we've seen Lawes crunch a Bourgoin scrumhalf. Just ask Julien Tomas. Your verdict: Was this a late tackle, or was he committed? The Chiefs have progressed to their first ever Super 14 final after a bruising match against the Hurricanes in Hamilton on Friday. The sell out home crowd witnessed the Chiefs outscore their opponents, winning the game 14-10. Ma’a Nonu opened the scoring for the Hurricanes after impressive Victor Vito broke the line and offloaded nicely for Nonu to collect and trot over the line. The Canes lost John Schwalger to the sin bin, which the Chiefs capitalised on as they scored a try through Sione Lauaki. Stephen Donald made the break that set the dangerous Sitiveni Sivivatu free, which led to some neat handling and then the big man flying down the wing, beating two attempted tackles with power and pace. Sivivatu featured prominently again later as it was his brilliant run that resulted in fullback Mils Muliana’s try in the 54th minute. Muliana was full of praise for his side after the match. "I'm absolutely proud of my boys - the heart and dedication in the last 10-15 minutes that went into defence, you can't train stuff like that," he said. The match ended in virtual darkness as fog descended on the field, with the Hurricanes desperately trying to overcome the four point deficit. The Chiefs held out though, so they'll travel to Loftus Versfeld to take on the Bulls in the final. Leinster won the Heineken Cup for the first time after holding off English champions Leicester Tigers at Murrayfield on Saturday. The 19-16 win and caps off another success for Irish rugby this season. Leinster started the match in style after a powerful surge from man of the match wallaby, Rocky Elsom. Brian O’Driscoll then slotted a neat drop goal, before impressive youngster Jonathan Sexton himself slotted an excellent long range effort. Leicester took the lead with a try from Ben Woods, who along with Julien Dupey, kept the Tigers in the lead. 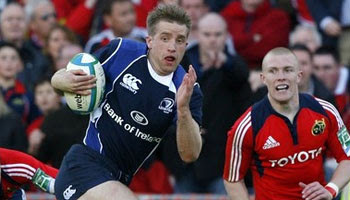 A try by Jamie Heaslip got Leinster back in the match, which was duly converted by Sexton. Sexton again slotted a kick, this time under huge pressure as he gave his side the 19-16 lead heading into the final ten minutes, a lead which they held onto to win the match and the title of champions of Europe. Winning captain Leo Cullen said: "We've had some tough times over the last few years. There have been some disappointing days, but the hurt in the past makes the wins sweeter." Brian O'Driscoll, who had another good match, was over the moon. "It feels great. I've played for this team for 10 years, some of the guys for 11 or 12 years. I love Leinster. It was a goal to win this competition before the season started. I couldn't have asked to win this with a better bunch of guys." The Super 14 2009 is almost over, as we’re into the Semi Final stages this weekend, with one team already having qualified for the big final that will decide who will be the provincial champions of the Southern Hemisphere. The standard of tries last week possibly weren’t quite as impressive as Round 13, but there were a few great moments of quality from certain players as the race for the Semis lifted the performances of all teams in the chase. The Chiefs secured their home semi by beating the Brumbies in a tightly contested match, but it was the losing sides flying winger Francis Fainafo who showed up speedster Lelia Masaga with his determined chase for a neat try. For the Hurricanes, one of the finds of the season has been big Sevens star Victor Vito, who played a significant part on both their tries against the Reds, namely setting up Piri Weepu, and then Ma’a Nonu. Keep an eye out for him in the future. Ryan Cross and Scott Staniforth both scored nice tries for the Force as they bid farewell to a whole host of players, by beating the Highlanders. Staniforth, Matt Giteau, and Drew Mitchell, to name a few, won’t be wearing Force colours again. The Stormers Joe Petersen continued his nice little bit of good form as he crossed again in Cape Town, but it was the Sharks who scored possibly the try of the week, with their long range effort against the Bulls, finished off by Steven Sykes. Hamilton on Friday, and the Bulls host the Crusaders in Pretoria on Saturday. 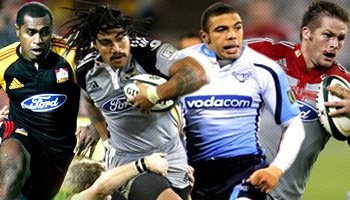 The Canes vs the Chiefs promises to be an open match with both sides possessing serious strike power out wide. Up front, fascinating battles will take place between the big men, as it's Rodney Soalo up against Sione Lauaki at the back of the scrums. The Chiefs have never made the Final, so will be looking to change that after their highly impressive season. In Pretoria we'll see the powerful Bulls being taken on by last years winners, the Crusaders. Richie McCaw's men had a slow start to the season, but as always, made things right and got themselves into a semi final position. The Bulls, 2007 champions themselves, will be without their first choice center pairing due to suspension and injury, but have speed to burn out wide, and a highly physical and confrontational forward pack. Loftus Versfeld is an intimidating place to play, but the Crusaders have loads of experience and quality, so wont be phased. This one should be a classic. We’ve got the next two instalments of the popular and intriguing series of The School of Hard Knocks, which sees a group of mislead youths attempt to turn their lives around by getting into rugby. With Scott Quinnell and Will Greenwood, both former Lions, as their guides, the young lads are in good hands and have already made progress in certain aspects of their game play, as well as off the field. In Episode 4 we see mr popular himself, Ben, arrive at training with strapping on his hand, which we later find out is a broken thumb which leads to him leaving the group, and possibly not returning. The boys are put through their paces in off field scenarios that include interview techniques, discussions about their futures, and they then get a special message from Tony Blair. One-on-one tackling drills later on in the day reveal some weaknesses, but big Scott steps up to give them the basics needed to take the man down. The improvements are instant and by doing the basics right, the players gain much needed confidence. Episode 5 brings with it some bad news, as a valuable member of the side gets arrested, and then another drops out of training due to his short fuse. An anger management course helps the boys deal with some issues, and one of the guys turns out to be a possible star goal kicker. With little time left before their big match, it's hard to say how they will fare. We'll keep following the progress as it occurs though. Scott Quinnell travels to Harlequins in this edition of the Crossbar Challenge as he hands them the challenge of throwing a rugby ball through the rugby posts from 40m out. There's been mixed results throughout the season, with Quinnell taking on clubs from around the country, and at times, being shown up by some players you'd least expect it from. Quinnell apparently had a slight injury, but is still leading the overall standings with his mark of 49m. Can anyone from Quins beat the big guy in his self proclaimed speciality? We see dynamic scrumhalf Danny Care with another one of these underarm flicks that never seem to come right. Wing David Strettle shows us his impressive throwing arm, as does big Nick Easter. It's a bunch of jokers after that though, as Quins show us that their team spirit is good, whereas their throwing arms are, to be frank, pretty damn poor. It's a good laugh though, with a tiny bit of blood spilled in the process. The Bulls will be without center JP Nel for their crucial Super 14 Semi Final against the Crusaders at Loftus Versfeld this weekend. Nel suspended for four weeks for this stiff arm tackle on Sharks fullback Stefan Terblanche. Nel and the Bulls have decided to appeal against the ban, which will take place in the form of a conference phonecall at 23:00 tonight, South African time. The suspension leaves the Bulls in a slight injury pickle, as Nel was a key member of their backline and with Wynand Olivier still struggling with a hip injury, they might be a bit thin in that department against the might and experience of last years winners. Nel was represented by the same team that helped to clear Bakkies Botha of any wrong doing, but they weren’t as fortunate this time around, as he has been suspended up to and including, June 13th for his tackle that was deemed dangerous. He will effectively miss a maximum of two matches, the Semi and possibly the final, despite the judicial officer having said that he considered a longer sentence, but felt that missing those two big matches were punishment enough. Nel’s track record of similar type hits with that heavily padded forearm probably influenced the decision. It’s not the first time we’ve seen him tackle like that. Just ask Gio Aplon and Rocky Elsom. Nel's appeal was rejected, so he will serve the suspension. Do you feel four weeks is fair punishment, or was it merely a poorly judged hit? Jonny Wilkinson, once regarded as the best rugby player on the planet, has completed a lucrative two year deal with French Top 14 club Toulon that will see him join a whole host of new players at the big spending club. Having spent 12 years at Newcastle, the 2003 World Cup winner will head across the channel in the hope of rejuvenating his career after suffering so many terrible injuries over the years. Wilkinson still only 29 years old, played just four games for his club last season and has since been sidelined for five months after dislocating his kneecap. He’s looking to change his fortunes with the move to France, and still has aspirations of playing for his country again, with a possible five years still left in his career. "I hope it will give me the games to rebuild an international career," he said. "I haven't played, for obvious reasons, and so I haven't figured for England and I want that to change. "I feel I have to give myself a new environment and a new start. I could not forgive myself if I didn't try everything to get myself out playing regularly." Wilkinson, who will be raking in a reported 700 000 euros (£623,000) a year, will probably make his debut for Toulon in mid August when the Top 14 campaign kicks off. There’s no doubt that a fit Jonny Wilkinson is one of the most commanding players to have ever set foot on a rugby field. Here’s hoping that Wilko finds his feet in France, and gets back to the kind of form that he achieved at his greatest hours. This BBC clip shows some of Jonny’s better moments for England over the years, specifically in the Six Nations. If he gets 100% fit, will he reach those highs again? Or is he past it? The Bulls won the match 27-26, ending on top of the table, denying the Sharks the win and a crack at making the Semis themselves. The match got off to a ferocious start, with this incident taking place within the first few minutes. The hot-headed Botha faced a disciplinary hearing on Monday afternoon following his lashing out at Kankowski with an open hand. He was subsequently cleared of any further punishment by the judicial committee though, after the defence argued that Botha pushed, rather than deliberately struck Kankowski with a slap. The Judicial Officer took into consideration the fact that the referee was in full view of the incident, and ruled that their was no intent to strike, but that the Bulls lock was simply trying to release himself from the grasp of the Sharks player. The Bulls and Springbok enforcer will be available for their home semi final against the Crusaders on Saturday in Pretoria, and should they make it, the final. Suspension, yellow card, or neither? Is Bakkies lucky to get away with this? The Super 14 Semi Finals have now been decided after another frantic weekend of rugby action. It went down to the last match, so the top four sides will now compete to make the final and have a crack at the prestigious title. We've got some of the best tries from the previous weekend for you today though, as we missed out on that one unfortunately. Round 13 provided us with some excellent tries from all over the park. Individual efforts and team tries with great offloading, we saw it all as the race for the top spots was on. The Lions surprised the Highlanders with a fantastic comeback in Johannesburg, while the Chiefs and the Hurricanes battled it out in a game that had more of a Test Match feel. The Chiefs once again produced a superb long range try. Joe Rokocoko got on the end of some nice passing after a great break by young Blues flyer Rene Ranger, and Bryan Habana showed his class by setting up Akona Ndungane for the Bulls. Jongi Nokwe, another flyer, showed his jetshoes as he finished off a length of the field turnover try for the Cheetahs, in the same match. In Cape Town we saw young eighteen year old James O'Connor impress once again, as he danced his way through the Stormers defence, but it was the electric home team's fullback Joe Petersen that scored two quality tries. Keep a lookout for our Random Guinness Premiership Tries compilation coming soon. The Leicester Tigers now stand in line to do the double as they won the Guinness Premiership Final 10-9 on Saturday at Twickenham. They will face Leinster this coming weekend in the Heineken Cup, as they look to win both English and European Championships. The underdogs London Irish fought hard, pushing the Tigers to the limit and at times looking the more creative side. Leicester gathered some momentum in the second half though, which led to a try by penalty shootout hero Jordan Crane, who had earlier been sin binned. It wasn’t a pretty match by any means, fully acknowledged by Tigers captain Geordan Murphy. "It was hard work," said Murphy. "We are going to have to raise our game next week." Leicesters stand in flyhalf Sam Vesty felt that the win sets them up nicely for next weekend’s crucial European Cup Final. "I think a good dirty, horrible win holds us in good stead for next week," said Vesty. "It is the perfect result. An ugly win keeps us on our toes. Sometimes you have to win ugly. No-one remembers how you became champions in 2009. All that matters is we are champions. The Tigers wont have much time to celebrate, as all focus now shifts to the upcoming weekend, and their big clash with Leinster in Edinburgh. Last weekend at Newlands the Stormers hosted the Force in a controversial Super 14 match that saw the lead change hands a number of times, but in the end resulted in a 25-24 victory for the home side. The Force’s loss meant that they missed out on a semi final position, and they felt that was mainly due to poor refereeing after Dylan Des Fountain allegedly held back Force center Ryan Cross as the Stormers went in for a try ten minutes from time. Force coach John Mitchell slammed referee Marius Jonker after the incident, saying that he shouldn’t referee another Super 14 game again, or should be disciplined in some manner. That incident aside, it was the same man involved that committed a horrendous error that will go down as one of the most embarrassing moments to occur for the team since Robbie Fleck’s classic error back in 2001. The Stormers had put together a stunning sequence of rugby that swept the length of the field before it came back across to the right and captain Luke Watson measured his scoring pass perfectly. Center Des Fountain was on the end of one of the Stormers’ best tries of the season, with the only thing required being to canter over the tryline and dot down the ball. Instead, with a massive smile on his face, he dropped it, much to the amusement of the Force backline players. As little as a few years back Matt Hampson was tipped as a future England star. Selected for the Leicester Tigers academy at a young age, Hampson was soon selected for the England u18, u19, and u21 squads before tragedy struck in 2005. A training accident changed his life completely as a scrum collapsed and he suffered a dislocation in his neck which trapped his spinal cord. 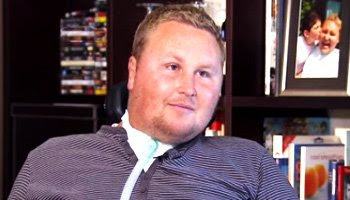 Matt was left paralysed from the neck down and his rugby playing days and bright potential as a star on the field were over. Matt’s seemingly dark future after the accident isn’t perhaps as dark as many would have expected. He has a spirit, charm, and lust for life that has led to him overcoming a situation that would have beaten so many others in his position. In this interview with Sky News, Hambo talks about the everyday struggles that living in his condition bring, but shows how positive he is about life and that he’s still as big a rugby fan as ever. He coaches, writes articles, maintains his website, and does what he can to raise money for spinal care for both himself and others. Matt requires £8m for his life-long care and we’d like to help by making the rugby community aware of what is needed to help this inspirational figure, a man who wont let even the worst of circumstances get him down. You can read more about Matt and make a difference by visiting his websites to do what you can to help, or simply leave a message of support if donating isn't possible. Tragedies like this can happen at any time, and when they do, it’s vital that the rugby community sticks together to take care of one of their own. All the best Matt. On Saturday as London Irish put pay to Harleqins ambitions of reaching the Guinness Premiership Final, Quins winger Ugo Monye showed the type of commitment and determination that has earned him his rightful place in the British & Irish Lions squad to tour South Africa. "People asked me if I dreamt of getting selected for the Lions," said Monye. "I'm not sure that dreams can take you that far. It's nuts, it's crazy. I'd got a holiday sorted to America but that can get cancelled. "Without doubt, it's been my most fulfilling season. The best thing now would be to go away with some success behind me. I don't want to be wrapped in cotton wool. You want to keep your form sharp, and be playing in big games. It's good for your confidence." Monye proved his worth for England this season in the two Six Nations matches that he took part in, with his tackle on Thom Evans being a stand out example of the mans work rate. "If there's one thing that's improved this season it's my defence," said Monye. "A lot of wings have got the ability to run fast, beat players and all that. I'm not sure every wing has got a solid defence. So, I've worked hard on that aspect. It's about positioning and awareness." Monye is lucky to have walked away from this horrific looking fall unscathed on the weekend after he went up for a high ball and was upended by his opposite number Adam Thompstone. He landed with his full weight on the back of his neck, causing alarm for spectators, players and medical staff. Incredibly, Monye stood up after a few minutes and played on, showing no signs of injury whatsoever. Look out for the rapid winger on the hard and fast surfaces of South Africa later this month with the British & Irish Lions. He's sure to have a huge impact. 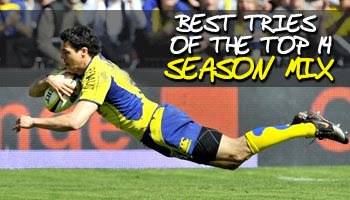 Throughout the season we’ve posted random Best Tries compilations from the Top 14 in France. As the season nears it’s end, and relegation and top spots are revealed, we’ve got a recap video of some of the more enjoyable tries from the past few months. Constantly in the headlines, the Top 14 and its big money spenders are often the subject of transfer speculation and discussions. The biggest spenders of them all, Toulon, have now officially survived the season in the top flight despite things at one stage looking like it was all falling to pieces. Jonny Wilkinson looks to be heading to Toulon for a huge amount of money, something that they will confirm and discuss with the public after their last game of the season on May 18th. Felipe Contepomi, Sebastien Bruno, Pierre Mignoni, Tom May and Kris Chesney will be joining him at the club that will be managed by Phillip Saint Andre. Other big English players are heading across to France, as well as a big Frenchman who has played in England for the past few years. Sebastien Chabal will be joining the newly promoted Racing Metro, and there’s rumours of Francois Steyn joining him. While this season featured big signings that failed to deliver completely, aka Sonny Bill Williams and Dan Carter, next season will be just as high profile as we see a new batch of big name players join one of the most intriguing leagues in world rugby. The Guinness Premiership Final takes places this weekend at Twickenham with Leicester Tigers taking on London Irish, who beat Harlequins 17-0 in the other semi final on Saturday. It was a fierce contest that bizarrely stood deadlocked at 0-0 going into halftime after six missed penalties, but it was London Irish who got on the board shortly afterwards when Delon Armitage kicked them into the lead. Substitute James Hudson crossed to put the Exiles in control, and when Mike Catt intercepted late in the game, the contest was effectively over. 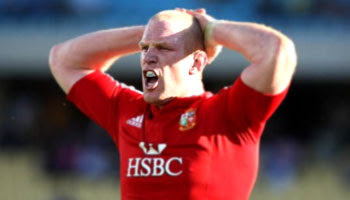 Catt, the 37 year old South African born former England back, is now having his name mentioned in Lions circles, as Ian McGeechan is yet to name a replacement for the injured Tom Shanklin. After the performance he put in on Saturday, London Irish coach Toby Booth has said that Catt should be packing his bags for his former homeland. "Mike Catt was absolutely outstanding. He should be going with the Lions," said Booth. "From what you saw against Harlequins at the weekend, find me someone who’s better. I can’t speak highly enough of him. The irony is he spent two days in bed with flu. We still started him because we know how important he is to controlling things. "Catty has a fantastic appetite - people dream about being able to do what he does at 37. He’s a credit to himself, his family and London Irish." 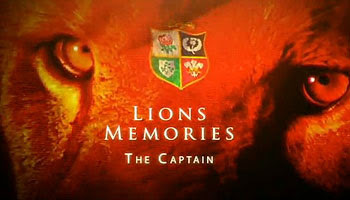 If Mike Catt does go on tour with the British & Irish Lions, he will overtake Neil Back's record as the oldest Lion. Experience will be vital on tour, so should he go, or is he past it already? Stirling Mortlock became the highest points scorer in Super rugby history when he overtook Andrew Mehrtens’ record on Saturday as his Brumbies side beat the Blues 37-15 in Canberra. Mortlock scored a try and kicked seven points as his side overcame a lacklustre start to then pick up a bonus point win after scoring five second half tries. The Blues made the most of their first half chances, but it was the home side that kept their semi final hopes alive as they moved into the top four, with next weekends match against the Chiefs in Hamilton being crucial to their title ambitions. Mortlock now sits on 994 total points, four ahead of All Black legend Mehrtens, a feat that please the Wallaby stalwart, but he took most satisfaction from the teams second half performance. “It's pleasing, but I was asked about it earlier in the week and I said that I'd take the win first and foremost and it was excellent that we grabbed the bonus point and got a good win,” he said. He was unfortunately taken from the field though after this crunching hit on All Blacks and Blues prop Tony Woodcock. Both players felt the affect of it, but it was actually Woodcock who stayed on the field, despite being on the receiving end. The Leicester Tigers booked their place in the Guinness Premiership final after they beat Bath comfortably at the Walkers Stadium on Saturday. The 24-10 win means that they will travel to Twickenham, to face London Irish in the final. Tries by Sam Vesty, Dan Hipkiss, and Lewis Moody, as well as 12 points from the boot of Julien Dupuy, completed the fairly emphatic victory. Fierce rivals all season, they’ve met four times, with Leicester winning three of those. Some felt that Bath would have the edge on this occasion, as Leicester came off that gruelling Heineken Cup Semi last weekend. The Tigers are a quality outfit though, and will probably be favourites to lift the trophy come next weekend in their fifth consecutive Guinness Premiership final appearance. Martin Corry announced his retirement in an emotional farewell which included a lap of honour for the former England captain. His side will no doubt be determined to send him off in style next weekend. The Sharks look to have ruined their chances of a Super 14 Semi Final place after going down 16-12 to the Waratahs in Durban on Saturday. Coming from behind twice, the Waratahs kept the Sharks tryless to record a determined win. Brett Sheehan made his 50th NSW appearance when he came on from the bench. It might well be his last game for them though, as he has signed for the Force, and will more than likely miss the rest of the tournament after this hit. The two test Wallaby put the late shoulder in on Sharks center Brad Barritt, only a minute from full time. Barritt, who returned this week from his stint in England with Saracens, was knocked out cold from the impact of the shoulder, and unfortunately had a few players land on top of him while lying there receiving treatment. Whether Sheehan will be cited or not remains to be seen, but there’s no doubt that he was lucky to get away with it on the field, as neither ref nor assistant refs saw it. Last weekend's epic Heineken Cup Semi Final between the Cardiff Blues and Leicester Tigers will be remembered more for the historic, and slightly, bizarre penalty shootout. If the Blues had won at the kicking contest though, the game would probably be more remembered for their sensational comeback, and some great tries. 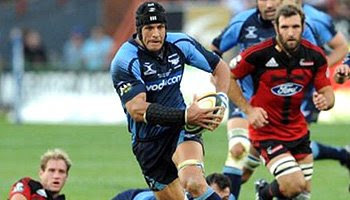 The Tigers scored two excellent tries through Scott Hamilton and Geordan Murphy, both of which were created in some part by flyhalf Toby Flood. Flood unfortunately injured himself during the match, rupturing his Achilles tendon and will be out of all rugby for the next 6 months. With just six minutes left in the match, and trailing 26-12, the Blues looked dead and buried with seemingly no way back. Two yellow cards for the Tigers soon changed that though, which sparked life into the Blues as they scored two quick fire tries through some brilliance from big Jamie Roberts, and superb finishing by wing Tom James. Kiwi Ben Blair had two absolutely vital kicks to convert from the touchline, which he duly slotted, resulting in a 26-26 stalemate that led to extra time and then the much spoken about penalty shoot-out. "It was strange to be involved in something like that, but it was pretty cool and we won it, so that helps," fellow Kiwi Craig Newby said. "I back myself with the boot. I love kicking goals. I lived with Willie Walker and I used to hang around with him after training when we played for North Harbour. Then I lived with Nick Evans for three years and did the same thing. I should have been first on the list really!" Martyn Williams though, the man who missed the vital kick for the Blues, wasn't as enthusiastic. "There's never been a penalty shoot-out before in rugby, so I guess I've earned myself a place in the record books. But it's not one that I wanted. "Lewis Moody, Geordan Murphy and Martin Corry all came over to me. They said they didn't feel like celebrating that much because of the way the game had ended, and they just said to keep my chin up. "Fair play to them, they are top men for doing that." Note: Watch the full penalty shoot-out via the link above. The British & Irish Lions set sail for South Africa later this month as they take on the World Champions for the first time since winning the series there in 1997. 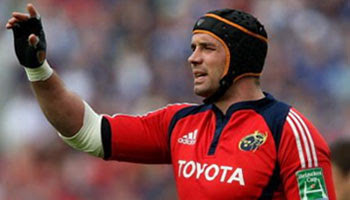 Munster's powerful leader Paul O'Connell is the man who has been handed the task of bringing together the four countries as they look to improve on their disastrous last tour in 2005. 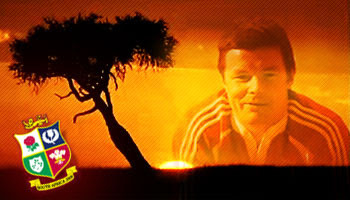 While O'Connell was most people's choice, many others have said that the inspirational Brian O'Driscoll should have been given the honour of being at the helm. Both are undisputed leaders, but each have different leadership styles that on any given day can bring the best out of even an average side. Taking on the Springboks in South Africa though requires a physical presence that must come from the forwards, which is why O'Connell would have gotten the nod. As we see in this great video, a captain doesn't need to be the loud and brash type though. Some of the greatest leaders have had the quietness and calmness required to fulfil the job. Are you happy with O'Connell as your Lions leader? Or do many still feel that BOD should have been bestowed with the honour? Either way, the Lions are in good hands when they're so spoilt for choice. Episode 3 of the interesting series of the School of Hard Knocks once again takes us into the lives of a group of young Welshmen who have been introduced to rugby as a means of getting out of the doom and gloom of their everyday lives. In the first two episodes we saw certain characters introduced as the boys learn about the ins and outs of rugby, with Will Greenwood and Scott Quinnell at the helm. Episode 3 takes us to the Millennium Stadium with the boys, as they get a tour of the awesome ground, and then get to watch the Welsh players train before meeting them and getting autographs. They're then taken through some gruelling physical training at an army camp and good old Ben makes himself popular once again. 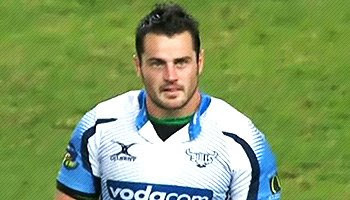 Sharks scrumhalf Rory Kockott has been handed a one week suspension after striking Highlanders flanker Adam Thomson during the home sides 23-15 win in the Super 14 at the Absa Stadium in Durban on Saturday. Kockott lashed out at Thomson after he was flung to the ground without the ball, and after the whistle. A fiery character, Kockott lost his nerve and lashed out with a mean flat handed left hook. Thomson was knocked to the ground, prompting assistant referee Craig Joubert to come on and advise referee Phillip Bosch that anything less than a red card is out of the question. Kockott appeared at a disciplinary hearing today and pleaded guilty to the charge. His lawyer had argued that a red card was sufficient punishment, but the SANZAR judicial officer felt that although Kockott’s action was a reckless, open handed slap as opposed to a punch, it still deserved a one week suspension. 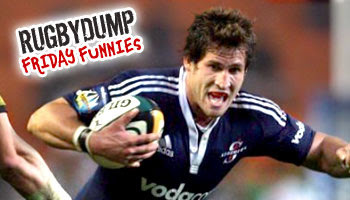 He will miss the Sharks’ crucial clash against the Waratahs, which will mean a major reshuffle to their backline. 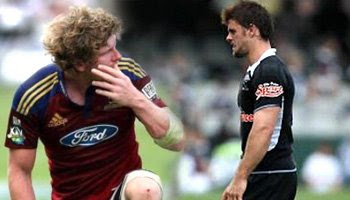 In the same match, the Highlanders Danie Bowden was yellow carded for a high tackle, and has since received a one week suspension himself. As the dust settles after another frantic weekend of rugby, we look back at the tries that made the difference between Leinster and Munster in the Heineken Cup semi final on Saturday. A historic victory from the side that were seemingly the underdogs, Leinster went toe to toe with last years winners and scored three excellent tries on the day through Gordon Darcy, Luke Fitzgerald, and Brian O'Driscoll. Leinster coach Michael Cheika was keeping his feet firmly on the ground when talking about the big win. "I think we stayed composed at a lot of the right times. We didn’t do very well in the lineout, really, but we were able to overcome that and get ball through other methods. We knew that. We knew we’d be coming under pressure in that area so... we’d some opportunities from other ball and I suppose, defensively, that was also a big part of trying to get some ball back as well, the defensive ruck. "We decided that we wanted to play in a Heineken Cup final. We stayed composed today and we want to make sure we stay composed for the next few weeks and try to have a better performance. "You can talk about this game in the future sometime but once you have the trophy they can’t take that away from you. So we’ve just got to knuckle down over the next few weeks, understand where we are in the bigger pictures of things and just build towards that game because a lot of things can happen between now and then." Leinster will meet Leicester in the final at Murrayfield on the 23rd of this month. In one of the most amazing finishes to a game of rugby you’re ever likely to see, Leicester Tigers progressed to the Final of the Heineken Cup after a dramatic Penalty Shootout against the Cardiff Blues. The match itself was a classic, with the Millennium Stadium once again being the stage for this incredible piece of theatre that played out in front of a crowd that sat on the edge of their seats throughout. The Tigers led 26-12 at one stage after tries from Scott Hamilton and Geordan Murphy, and four penalties from Julien Dupuy. The game was theirs, and it looked as though Cardiff had no way back. The game shifted radically though when Craig Newby and Murphy were handed yellow cards as they defended desperately. Cardiff took advantage and Jamie Roberts and Tom James both scored sensational tries, levelling matters at 26-26. Extra time commenced, and neither side could score after the two ten minute halves, leading to a rare occurrence – the rugby penalty shootout. Kicked from the 22 meter line, directly in front of posts, each side would have 5 attempts before it goes to sudden death. We’ve got the full shootout for you, so sit back and enjoy all the drama as it unfolds. We’ll hopefully get the tries up soon too. Note: Join the forum and discuss the semis in more detail if you'd like. Munster Flanker Alan Quinlan will wait anxiously to see if he’ll still be on the plane to South Africa later this month after TV replays showed what looked like an attempted eye-gouge on Leinster captain Leo Cullen in the Heineken Cup semi final at Croke Park yesterday. Quinlan will now wait to see if an independent citing officer takes action against him, which will probably result in a few months on the sideline. 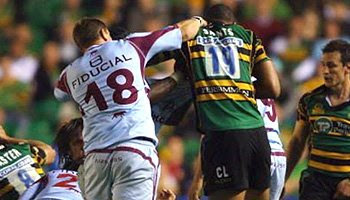 Neil Best of Northampton received an 18 week ban for eye-gouging earlier this season, and Dylan Hartley, also of Northampton, was out for six months in 2007 after his similar offense. Lions skipper Paul O’Connell naturally stood up for his teammate. "Quinny isn't that type of guy. "He is a tough player. It is the one thing he hasn't got in his record book. If it looked bad, I am sure there was nothing in it," O'Connell said. If consistency in citing procedures is what the rugby world is after, then Quinlan will no doubt be watching his mates take on the Springboks from the comfort of his living room. Leinster shunned their underdog status as they convincingly beat Munster 25-6 in the Heineken Cup Semi Final at Croke Park on Saturday. They avenged their 30-6 semi-final mauling by Munster in 2006 as they defied the odds to record a famous win over their arch rivals in front of 82 000 fans. Brian O’Driscoll received the Man of the Match award, but was humble in acceptance as the Leinster pack were immense on the day. "I'll certainly accept it on behalf of them," he added. "They set the platform for us to get our tries. "Games are won and lost at ruck time. The speed of ball is critical. "We managed to get some quick ball ourselves when we were going forward and managed to slow them down which was exactly as we wanted it. “We've lost twice to Munster this season as well so we really felt we owed them one," he said. "People had questioned our integrity, our pride, our passion, but we produced a big passionate performance today." We’ve got a short montage from the game for you, but will try get full highlights up soon too.